In case you missed it, the Spokane Transit Authority Board of Directors officially voted to approve the “STA Moving Forward” plan last Thursday. Along with a vote to approve The Plaza renovation, the board also voted 6-3 to go to the ballot in April for a 3/10th’s increase in the local sales tax to help fund this plan as well as sustain/preserve current service levels. The vote is still some 4 months away, but the campaign is already starting. Expect to see more posts here on Transit 509 in the coming weeks as we get closer to April. You can also stay up to date by following @transit509 on Twitter. A GN freight train carries the front car of a monorail through Spokane in route to Seattle. After Spokane hosted Expo ’74, the concept of futurism was a constant thought in the city. At the same time, there was a continued demand for better transit service, the city having gone through decreases in service in the decade prior with Spokane City Lines before the city took over the franchise themselves. On the other side of the state, Seattle was running a short one-mile monorail system that ran from the Westlake area of downtown to Seattle Center (home to Key Arena and EMP) in Lower Queen Anne. Perhaps in another example of “Seattle-envy,” local politicians looked at the Seattle monorail and tried to see if the same could be done in Spokane. A monorail is in Spokane’s future – at least in the “wild dream” Commissioner Jack H. Bell outlined for the Spokane Transit Commission yesterday. The commission took no action on Bell’s idea, but approved the “concept” of spending up toe $300,000 for “novelty-type” transportation in Riverfront Park. No funds are available, however transit manager Robert W. Harder said. Bell said a monorail would be one way of providing the “novelty-type” transportation the commission is considering to serve the Opera House-Convention Center and Riverfront Park. But he admitted a monorail may not be practical. “It’s a very, very long-range plan of mine,” he said. The commission is studying ways to transport persons to the park and the Opera House from the Coliseum parking lot to alleviate the parking shortage on the south side of the Spokane River. Among others things, Disneyland-type trains are being considered. He said he envisions a monorail that would loop through the park with stops at the YMCA building, the Opera House, the entertainment center in the former U.S. Expo Pavilion and possibly at Wall and Spokane Falls Boulevard. “Phase II” of the monorail could extend service to a satellite parking lot near Francis and Division and from there to Joe Albi Stadium, he said. If “Phase II” were successful, “Phase III” might extend a line from the park to the South Hill, perhaps to a satellite lot near Fifty-seventh and Regal. “Phase IV” might be a line to the Spokane Valley, Bell speculated. “People could get downtown in 10 minutes on a monorail,” Bell said. Harder said the 30-minute intervals between buses the commission ordered will make schedules easier to understand and will reduce anxieties about missing a bus. Intervals now range up to 55 minutes during non-peak hours, he said. Also, the commission decided to have all layovers occur downtown. Harder said some patrons had been frustrated to board a bus near the end of its line and experience a layover before continuing to the downtown area. The new schedules have buses leaving the central business district and arriving at 15 minutes before and after each hour. The experimental, cross-town route is to be used from Oct. 1 to the end of the year, commissioners noted. The estimated $95,000 cost is to be paid largely by the U.S. Urban Mass Transit Administration. Two buses are to cover a six-mile, “figure-8” route between Francis and Wellesley, Market and Assembly. Riders may transfer to north-south routes. Obviously, a monorail system was never brought to Spokane. In later years, discussions of light rail, a more proven technology, started to pop up (though we also know how that ended). 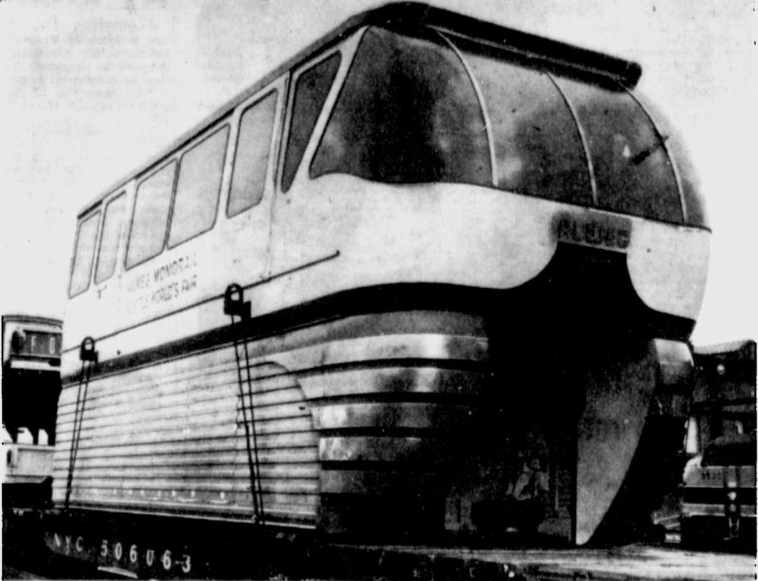 Many other metros likely thought about starting their own monorail systems as well, but presently only 3 cities in the US have any operating: Seattle, Las Vegas, and Jacksonville. There are also smaller operations at zoos, shopping malls, and amusement parks, most notably among them Disneyland and Disney World (the first monorail in the US). Beginning tomorrow, June 17th, Dayton Street Transit Center will be temporarily closed as the City of Kennewick begins work to build a new Dayton Street Bridge over the canal. Buses will not be able to run on Dayton Street while construction is going on, so there will be a temporary transfer point located just to the east on Auburn Street, next to the Kennewick Senior Center (at the east end of Keewaydin Park). This temporary closure is schedule to run through the end of August, but there is a possibility it could run a couple of weeks into September if construction crews have any delays. To further explain the details in the map above, I’ll list the detours for each route and the stops that’ll be missed as a result. Route: Heading inbound (eastbound), the bus will follow the regular route via 3rd Ave, Washington Street, 2nd Ave, and Auburn Street before stopping at the temporary transfer point. Heading outbound (westbound), the bus will continue south on Auburn Street, east on 7th Ave, north on Washington Street, and east on 3rd Ave to resume the regular route. Stops: Heading inbound (eastbound), the bus will not serve the stops at 6th Ave/Auburn Street (former Kennewick School District offices, across from fire station) and 6th Ave/Dayton Street (city pool, across from Kennewick High School). Heading outbound (westbound), the bus will not serve the stops at 1st Ave/Auburn Street (Basin Department Store) and Washington Street/1st Ave (Circle K, across from Domino’s). Route: Heading inbound (eastbound), the bus will head east on 4th Ave and follow it down as it becomes Vineyard Drive and then 1st Ave, bypassing the usual turn onto Garfield Street. Continuing east on 1st Ave, the bus will turn right and head south on Auburn Street before stopping at the temporary transfer point. Heading outbound (westbound), the bus will continue south on Auburn Street, west on 6th Ave, north on Garfield Street, and west on Vineyard Drive to resume the regular route. Stops: Heading inbound (eastbound), the bus will not serve the stops at Garfield Street/5th Ave (St. Joseph’s Church) and 6th Ave/Dayton Street (Kennewick High School). Heading outbound (westbound), the bus will not serve the stop at 1st Ave/Everett Street. Route: Heading inbound (eastbound), the bus will keep heading north on Garfield and follow it down to the corner of Vineyard Drive, bypassing the usual turn onto 6th Ave. Turning eastbound onto Vineyard Drive – 1st Ave, the bus will turn right and head south on Auburn Street before stopping at the temporary transfer point. Heading outbound (westbound), the bus will continue south on Auburn Street, west on 6th Ave, and then south on Garfield Street to resume the regular route. Stops: Heading inbound (eastbound), the bus will not serve the stop at 6th Ave/Dayton Street (Kennewick High School). Heading outbound (westbound), the bus will not serve the stops at 1st Ave/Everett Street and Garfield Street/5th Ave (St. Joseph’s Church). Route: Heading inbound (eastbound), the bus will turn north from 10th Ave onto Garfield Street, then head north to the corner of Vineyard Drive. Turning eastbound onto Vineyard Drive – 1st Ave, the bus will turn right and head south on Auburn Street before stopping at the temporary transfer point. Heading outbound (westbound) the bus will continue south on Auburn Street and follow the regular route. Stops: Heading inbound (eastbound), the bus will not serve the stop at Dayton Street/8th Ave (Columbia Industries, behind Trios Hospital). No stops are missed when heading outbound (westbound). 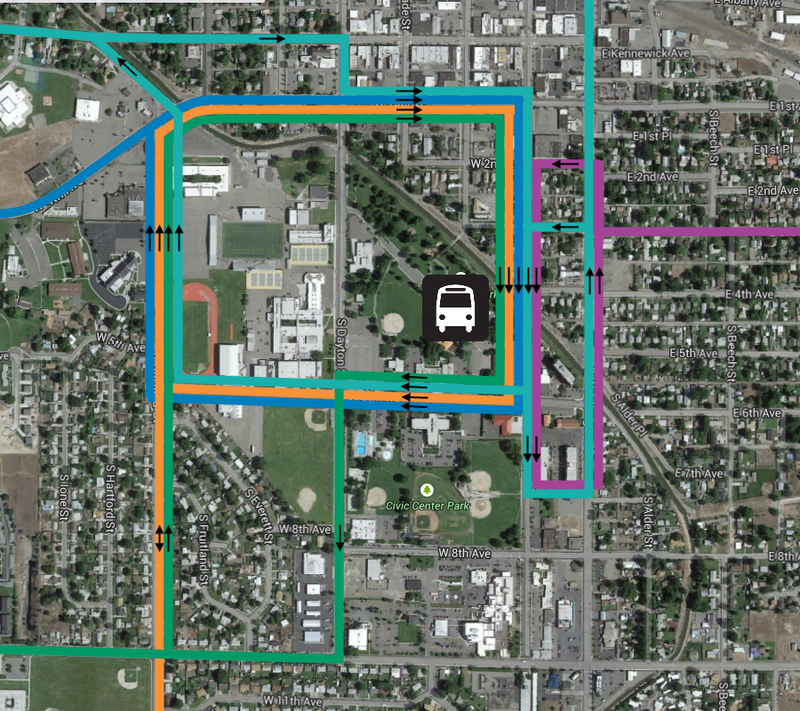 Route: Heading inbound (from Three Rivers TC), the bus will keep heading east on Kennewick Ave and follow it down to the corner of Dayton Street, bypassing the usual turn onto Carmichael Drive. On Dayton Street, the bus will head south, then turn east onto 1st Ave, then turn south onto Auburn Street and follow it down to the temporary transfer point. Heading outbound (to Pasco), the bus will continue south on Auburn Street, east on 7th Ave, and north on Washington Street where it will resume the regular route north of 1st Ave. Stops: Heading inbound (from Three Rivers TC), the bus will miss the stops at Garfield Street/5th Ave (St. Joseph’s Church) and 6th Ave/Dayton Street (Kennewick High School). Heading outbound (to Pasco), the bus will miss the stop at 1st Ave/Auburn Street (Basin Department Store), though it will still be served by the bus when heading inbound. Route: Heading inbound (from Pasco), the bus will turn west from Washington Street onto 3rd Ave, then head south on Auburn Street to the temporary transfer point. Heading outbound (to Three Rivers TC), the bus will continue south on Auburn Street, west on 6th Ave, north on Garfield Street and continuing onto Carmichael Drive, and then west on Kennewick Ave to resume the regular route. Stops: Heading inbound (from Pasco), the bus will miss the stops at Washington Street/1st Ave (Circle K, across from Domino’s) and Washington Street/5th Ave (former Washington Street Deli) and 6th Ave/Auburn Street (former Kennewick School District offices, across from fire station), though the last one will still be served by the bus when heading outbound. Heading outbound, the bus will miss the stops at Kennewick Ave/Dayton Street (across from Kennewick First United Methodist Church) and Kennewick Ave/Fruitland Street (across from Kennewick Flower Shop). Please note that any of these detours are subject to change. For more information, please call Ben Franklin Transit at (509) 735-5100. Make some room on your calendar! On July 1st, there’s going to be a Transit Meet-Up in Spokane. Being put together by Karl Otterstrom (STA’s Director of Planning), it’ll start at 6:30PM and will be held at Chairs Public House, located at 1305 Hamilton Street in the Logan neighborhood. Whether you consider yourself an advocate, transit nerd, or just a regular bus rider, anyone and everyone is welcome to attend. 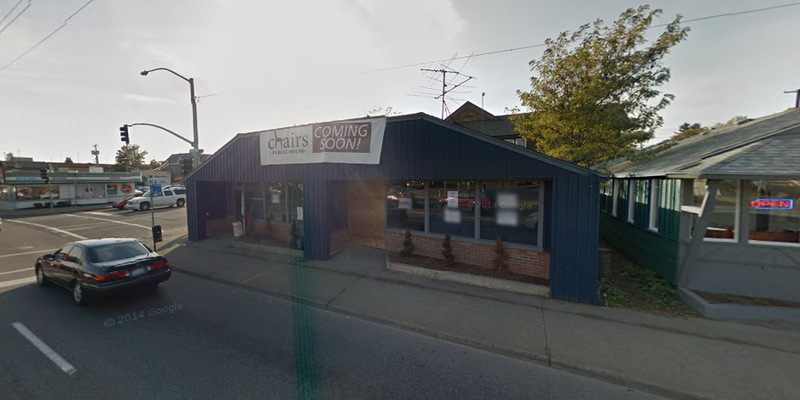 Chairs Public House is an all-ages venue, so there is no age restriction. Getting there is quite easy, as STA has a bus stop right at the front door. Both Route 26 and Route 28 serve Hamilton Street through the Logan neighborhood. If you’re coming from The Plaza, your best bet is to catch the 26 at 6:20PM and disembark the bus across the street in front of the Tesoro gas station at the corner of Sharp Ave (the 2nd bus stop heading north on Hamilton). You can also catch the 26 at 6:05PM heading south from the Northside Shopping Center and disembark in front of Chairs just a little past 6:30PM. From Spokane Community College, you can catch the 39 at 5:42PM or 6:42PM and disembark at Hamilton and Mission, then walk two block south to Chairs and arrive at about 5:50PM or 6:50PM. To help give a rough head count for how many people are attending, please either leave a comment below or send a tweet to Karl (@pedestrianman) or myself (@transit509). Both of us will be there, and for myself I look forward to meeting everyone who comes! Eastern Washington came up big this year at APTA 2014 Bus Roadeo as they took home 1st place victories in both the 35-foot and 40-foot divisions. Gabe Beliz from BFT took 1st place in the 35-foot division, besting 17 other coach operators from across the country. The competition in the 40-foot division was much fiercer, as Gabe Fernos from STA took 1st place while Daniel Schmidt from BFT took 2nd place just 5 points behind amongst a group of 53 coach operators. I’ve said it a few times already, but I’ll say it again: Congratulations, and great job guys! For the first time since 2007, Walla Walla and College Place bus riders won’t have to pay bus fares all summer. Running from June 1st to September 1st, all Valley Transit services (except the Job Access service) will be free of charge. The first time Valley Transit did this in 2006, ridership jumped up 57%, with the following year seeing a 25% spike. Summer is in the air, which means that the trolleys are going to be running again in Yakima this season. Trolleys will run on the Pine Street line from 10AM – 3PM on Saturdays, Sundays, and holidays. The big news for the 2014 Operating Season is the full reintroduction of service on the Selah line, which before the centennial run last operated more than 8 years prior after copper thieves stole the wire along the line. As of now, YVT plans to run service on the Selah line with a trolley powered by a tow-along motor generator, as not all the wire has been replaced on the line. Departures from the trolley barn for the Selah line are tentatively scheduled at 10AM, 12PM, and 2PM. They recommend checking their website to double-check the schedule, as the plans are subject to change. You can also find more information on fares and even membership on their website, or you can always call them at (509) 249-5962. After spending the last few months trying to figure out if the Yakima-Ellensburg Commuter will continue to run, it seems that Yakima Transit finally has a plan to preserve the service. On June 5th, there will be a public hearing at the Public Works facility (2301 Fruitvale Blvd) in Yakima at 5:30PM to take comment on the proposed changes to the service. During the school-year, there will be one less trip daily on the “Seasonal” schedule (7 trips each way Monday to Friday). During non-school days, there will be two less trips daily on the “Off-Seasonal” schedule (6 trips each way Monday to Friday). All service on Federal Holidays is eliminated (New Years Day, MLK Jr. Day, President’s Day, Memorial Day, Independence Day, Labor Day, Veterans Day, Thanksgiving, and Christmas). If approved, the fares for the Yakima-Ellensburg Commuter will also be increased for the second time since the service started, with one-way trips going from $4 to $5 and the monthly pass going from $125 to $150. As it currently does, the one-way tickets will still include a free transfer to any other Yakima Transit route, and the monthly pass still includes unlimited usage on all Yakima Transit routes. With theses changes, there will also be a new operator coming aboard to run the service. After Hopesource announced they were ending their contract with Yakima Transit effective June 15th, the city had to scramble a bit to find a new operator. That new operator is Central Washington Airporter. In a bit of irony, the owner of CWA was actually one of the Yakima-Ellensburg Commuter’s earliest critics, but it would seem that mindset has changed in the last couple years. CWA already has some experience in the intercity transit market, with their popular Airpoter Shuttle service as well as operating contracts for the Grape Line and Gold Line bus routes. With the alternative being the complete elimination of the service, this proposal seems to be the best option for the continuation of the Yakima-Ellensburg Commuter. I highly recommend that any and all riders that want to make sure this service continues go and attend the public hearing on June 5th to make sure that happens. In lieu of a new Transit Throwback post today, I thought it would be a good time to look back on coverage of transit history from the site’s past. While the Transit Throwback series has only been going for just over two months now, transit history has always been a big focus of this website as you’ll see below. In the early 1990’s, Yakima tried running a downtown circulator bus. Find out why the service only lasted a few years. Intercity bus tickets in Washington State used to be much cheaper than present prices. Find out just how cheap they were, and also learn a little about the history of intercity bus stations in Ellensburg. Spokane Transit Authority is currently in the midst of a complete bus stop sign update. Learn about the past of the old bus stop signs, and a few other interesting stories on bus stops in Spokane. Before Ben Franklin Transit began operations in 1982, they had to find some buses. See just how far they had to go to find those buses, and what their fate was when BFT finally got rid of them. Was “The Plaza” The Right Name? Now just a blip on the map, Plaza WA was around before Spokane Transit Authority decided to use “The Plaza” as the name for their new downtown transit hub in 1995. The Spokesman-Review explores this further in a mostly satirical piece. A bit of an oddity in the Ben Franklin Transit system, this post looks back at the history of Route 225 and how it ended up in it’s present incarnation. Written originally by Blair E. Kooistra, this post takes an extensive look at the history of the Walla Walla Valley Traction Company, which includes the city’s former streetcar/interurban system and freight railroad operations. After I-695 made the MVET (Motor Vehicle Excise Tax) illegal in Washington State, most all transit agencies saw a severe decline in their budgets. This post looks at the potential service cuts that Ben Franklin Transit would have made if voters didn’t approve an increase of 0.3% to the transit sales tax in 2002. In the mid to late 1980’s, Ben Franklin Transit partnered with the Parks and Recreation departments in Kennewick, Pasco, and Richland to put out an activity guide each summer. Perhaps of most interest was the complete system map included in each guide, including separate maps for each of the three cities. When Ben Franklin Transit moved into their new base facility in the Richland Y area, a female “employee” named Ben came along for the move. Learn more about this unique part of Ben Franklin Transit’s history.